/ Chalk Supply Small Synthetic Bristle Paint Brush, 1-3/4"
Chalk Supply Small Synthetic Bristle Paint Brush, 1-3/4"
The oval shape of this synthetic brush allows for a large load of paint while the super soft bristles maintain a smooth finish. 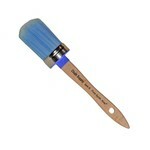 Excellent for painting large areas quickly but still avoiding brushstrokes. Total length of 8" with a 5 1/4" long handle. The bristle has a length of 2 1/4", width of 1 3/4" and and height of 1".